Located south of the River Danube near the city of Zaječar, in the vicinity of the village Gamzigrad, the palace of Emperor Galerius is one of the most important Late Roman imperial sites in SE Europe. C Galerius Valerius Maximianus was Caesar from 293 to 305 and Augustus and successor of Diocletian from 305 to 311. The location is considered to be the birthplace of the emperor, who built the palace as retirement residence at the end of the 3rd/beginning of 4th century during his reign as Augustus. 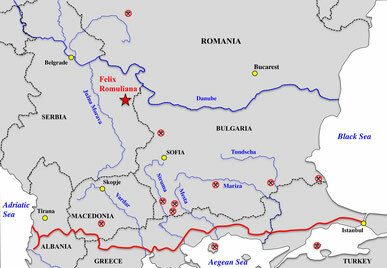 The position of Felix Romuliana in todays Serbia and the most important waterways. 76 architectural parts were investigated in order to get information about the origin of these marbles and the corresponding trading routes. It has to be kept in mind that the region is, for geological reasons, totally lacking any marble occurrences. For the architectural marbles the provenances from Prokonnesos, Pentelikon and Thasos was testified.The logistic efforts to haul the marble and also premium building materials for decorative architecture in general to this site are respectable, considering the remote location of Felix Romuliana aside important overland-roads. The majority of the investigated sculptures are made of fine-grained marbles both from the imperial quarries of Pentelikon and from those of Afyon/Docimium in Asia Minor. 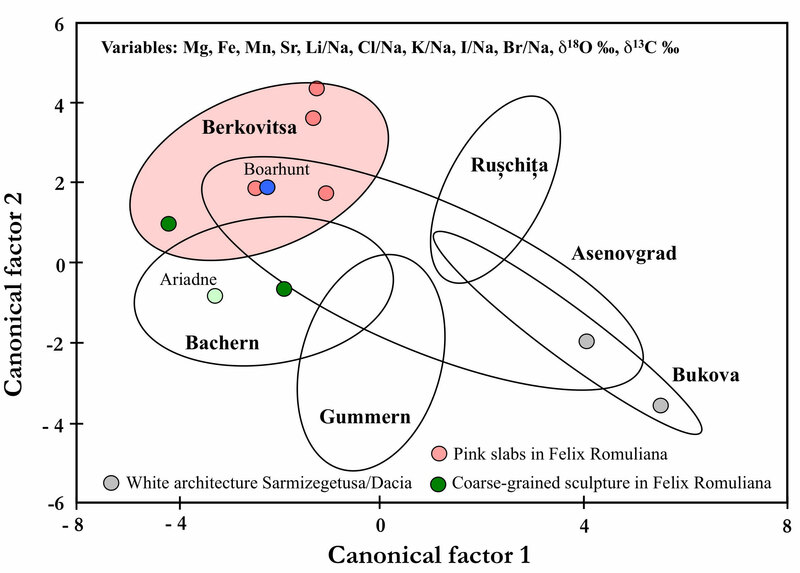 Several plates and fragments of pink marble can be found in Felix Romuliana with similar isotopic composition as white marbles of veneers and slabs. The white marble of a prominet sculpture of a "boarhunt" found as a spolia outside the walls also belongs to this type of marble. 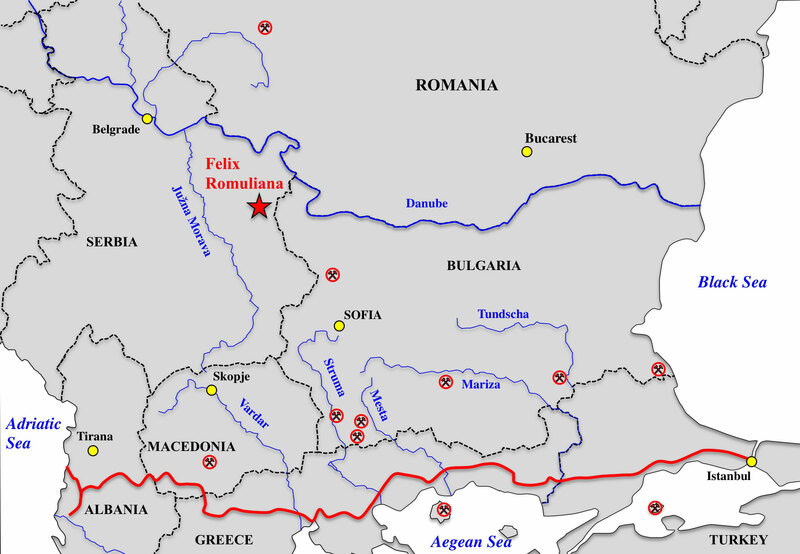 The intense search for pink marble and multimethod provenance analysis pinpointed these fine- to medium-grained pink and white marbles to the NW Balkans near the town of Berkovitsa in the district of Montana/Bulgaria. Intermeshing grain-boundaries, twisted twin lamellae, MFG ~ 1mm are the characteristics of the Berkovitsa marbles. 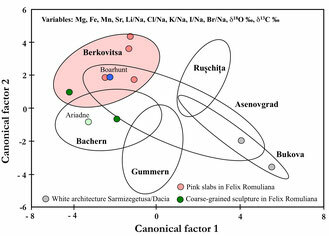 The white marbles of the "boarhunt" and the pinkish varieties of veneers and plates from Felix Romuliana clearly plot in the Berkovitsa-filed in the multivariate plot of the 2 most powerful factors of the multivariate analysis.